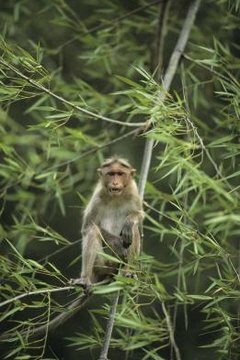 The adaptable and highly social rhesus macaque, macaca mulatta, lives throughout Asia, including Afghanistan, Pakistan, India, southeast Asia and China. These primates travel in groups numbering from 10 to more than 100. Adult females give birth to one baby per year and raise it with the assistance of male and female community members. Rhesus macaque groups exhibit dominance hierarchies in both sexes, and young macaques inherit their social status from their mothers. The more transient male does not stay in the same troop permanently, so dominant females lead rhesus communities. Dominant status for females is a birthright, while males acquire dominance by exhibiting superior size and strength relative to other males in the troop. The dominant macaques have priority over food and living space within the troop. Females give birth to a single baby after a 165-day gestation period. The newborn clings to its mother’s belly, and research shows rhesus macaque mothers and their babies bond in ways similar to that of human mothers and infants. The mothers and babies gaze at each other more than at other monkeys, and they communicate with soft noises and mimicry. These gestures seem to disappear after the newborn’s first month of life, as it starts to move around on its own and explore its surroundings apart from its mother. Like most primates, females are primarily responsible for rearing infants within the troop. Although the mating habits of these primates make it impossible for a male to know whether an infant is his offspring, close male friends of the mother often assist in grooming and caring for the infant. Older infants ride on their mothers’ backs and are nursed for as long as a year. After the young are weaned, females remain with the same troop while males move to a different group. Infant rhesus macaques are frequently handled by close female relatives, and they're protected by the males of the troop. Once the infant is able to move about on its own, the younger non-breeding females in the community become more interested in the baby and will groom it and attempt to carry it around. Much like human teenagers who babysit, this behavior teaches and trains the younger macaques how to care for their own babies in the future. Mothers encourage the younger females while keeping a watchful eye.